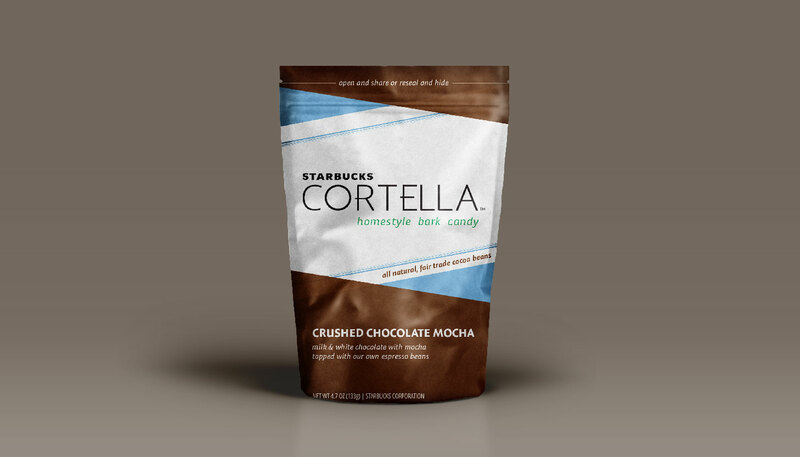 Cortella is a conceptual brand extension for Starbucks. Cortella is bark candy that is sold in full bars or in bags of smaller crushed pieces. The choice to extend the Starbucks brand into bark candies came from finding foods that pair well with coffee and can associate well with the flavors consumers are used to. Bark candy is also a more premium style of candy that fits within the high-quality product Starbucks already boasts. 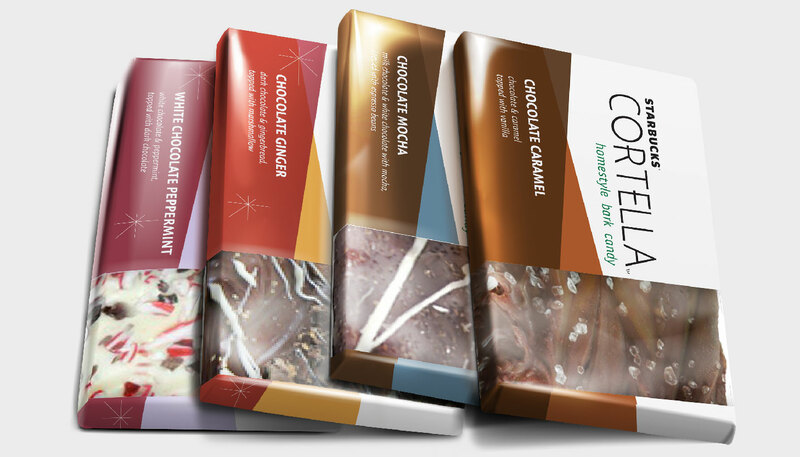 These bars would be made with fair trade cocoas, much like their beans, and would have visible toppings that add to the visual quality that is expected of Starbucks. The brand identity stands as unique while still falling well within the line of Starbucks brands such as Tazo, Fresh Evolution, Fizzio, and Via. The coloring on the packaging was designed to relate with the flavor of the particular bar, for instance the caramel bar’s accent color is a burnt orange that matches a caramel flavor. The hard lines and angles of the packaging help communicate the ability to break and share the candy bars while enjoying a cup of Starbucks with a friend. The bars would come in two ways. First the individually wrapped bars would be sold next to the register at your local Starbucks. Secondly are bags of the candy to be sold on store shelves. These bags would have crunched up and broken pieces of the candy in a resealable bag.